Hi PISO FARE friends! Do you want to become a Cabin Crew? Or, do you know someone who aspires to be one of the friendly Cebu Pacific Flight Attendants? Cebu Pacific Air will be having a CABIN CREW GRAND RECRUITMENT this coming November 5, 2016. The fastest growing airline has job opening for Cabin Crew applicants who met the minimum qualifications of the airline. To apply you need to personally go to the recruitment venue bringing your updated resume. Or, pre-register in their main office. 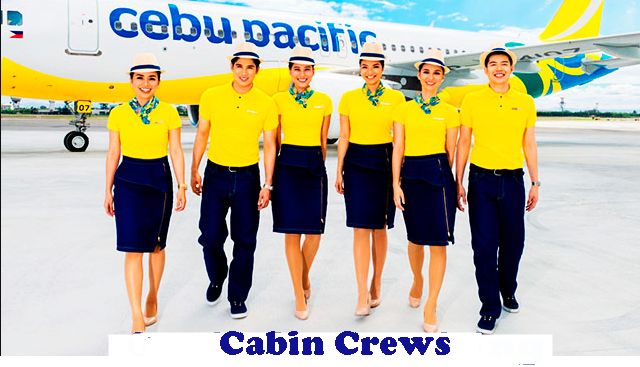 The perks of being a Cebu Pacific Cabin Crew include among others: Unlimited travel benefits, Competitive Compensation package, Medical coverage, Annual Performance bonus and working in a fun environment with young and dynamic people. What are the responsibilities of a Cabin Crew? Pre-registration is ongoing until October 26, 2016. Walk-in applicants will also be entertained. Bring your updated CV with 2×2 photo. Acceptance of CVs will be from 9AM to 1PM only. Applicants must come wearing Business Attire. For female applicants, come to the recruitment fair in proper business attire: preferably sleeveless blouse with blazer paired with below the knee skirt. Do not wear stockings. For male applicants- come to the interview wearing business attire. For more updates on airline CABIN CREW job hiring, PISO FARE promos and promo fares, LIKE and FOLLOW PISO FARE TICKETS on Facebook!! !